This 5 Star Salute is the perfect way to dress your table for the 4th of July—or anytime you want to show a little patriotism. 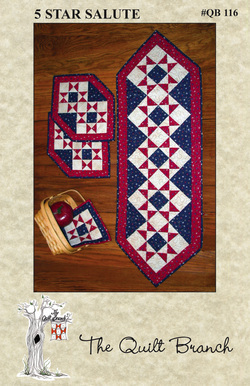 Featuring a collection of red, white & blue fabrics, our 5 Star Salute quilt pattern includes directions for a table runner (18" x 54"), placemats (14" x 21") & a candle mat (9¾" square). Fast & easy to piece, this pattern will have your table ready for summer in no time at all!